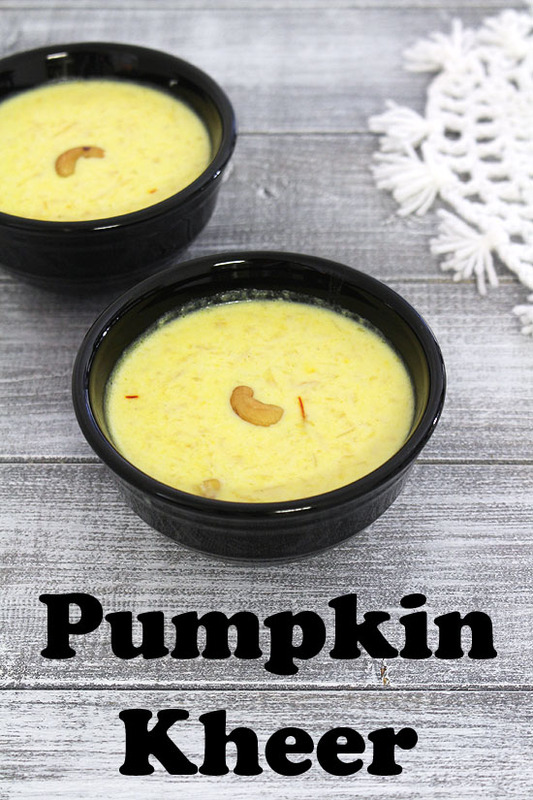 Pumpkin kheer recipe – Pumpkin is called kaddu in Hindi, so it is kaddu ki kheer recipe. I have made it few weeks ago, but didn’t get the chance to write down and share. But the pumpkin season is still going on, I thought it is not yet late. Many people do eat pumpkin during the Navratri fasting, we do not though. Every family have their own tradition. If you eat then this can be made during the vrat or upvas. There are two method of making kaddu ki kheer. First is using grated pumpkin. I am sharing this method today. Second is using cooked, mashed pumpkin. The difference is in the texture. The kheer made with this recipe has some texture aka bite of kaddu in it. While made with mashed pumpkin will give you smooth texture. 1) First of all peel and grate the pumpkin.Here I needed small amount, so I used box grater. If making bigger batch then you may use food processor like I have done for pumpkin halwa. 3) Once hot and melted, add cashews. Fry till they are golden brown in color. Drain the excess ghee and remove it to a plate and keep it aside. 4) In the remaining ghee, add grated kaddu and mix. 5) Cook for 3-4 minutes. It will starts to soften and shrink in size. 7) Now take milk in the same pan. And bring it to a boil on medium heat. 8) Let it simmer for 8-10 minutes. Do stir every 2-3 minutes to make sure that it is not sticking to the bottom and sides of the pan. It should be reduced and thickened slightly. If making bigger batch then you may need to simmer for longer period of time. 9) Now add cooked pumpkin. 11) Let it simmer for 4-5 minutes. 12) Now add sugar and mix. Again let it simmer for 4-5 minutes. 13) Now add cardamom powder and mix. 14) Also add fried cashew. 15) Lastly add rose water and stir. 16) Now check the consistency of the kheer. It should be thick and when you pour a ladleful of it back to the pan, it should drop in the same flow. If the milk and pumpkin stays separated then let it simmer for few more minutes and then check again. NOTE: here I have used sugar pumpkin which is easily available here in USA. But you can use white pumpkin also known as ash gourd. In that case, you need to squeeze out the water after grating it similar to this lauki kheer and then use in the recipe. 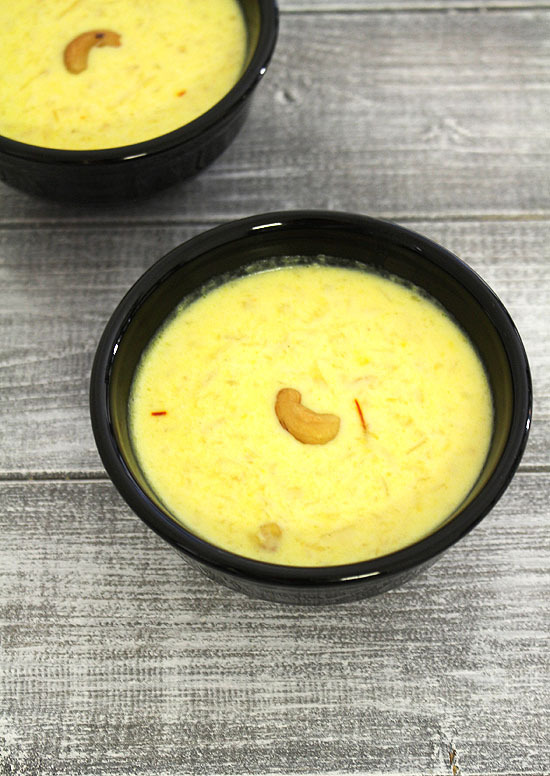 Serving suggestion: Serve kaddu ki kheer warm or chilled as a dessert. First of all peel and grate the pumpkin. Once hot and melted, add cashews. Fry till they are golden brown in color. Drain the excess ghee and remove it to a plate and keep it aside. In the remaining ghee, add grated kaddu and mix. Cook for 3-4 minutes. It will starts to soften and shrink in size. Now take milk in the same pan. And bring it to a boil on medium heat. Let it simmer for 8-10 minutes. Do stir every 2-3 minutes to make sure that it is not sticking to the bottom and sides of the pan. It should be reduced and thickened slightly. If making bigger batch then you may need to simmer for longer period of time. Also add saffron. Let it simmer for 4-5 minutes. Now add sugar and mix. Again let it simmer for 4-5 minutes. Now add cardamom powder and mix. Lastly add rose water and stir. Now check the consistency of the kheer. It should be thick and when you pour a ladleful of it back to the pan, it should drop in the same flow.